LUWERO DISTRICT, Uganda — As part of USAID’s Feed the Future project*, the International Institute of Tropical Agriculture (IITA) in collaboration with Hanns R. Neumann Stiftung (HRNS) have established 10 Climate Smart Investment Pathway (CSIP) demonstration plots in Luwero and Ntungamo districts in Uganda for research and learning on good agronomic practices for coffee. The research will inform the Coffee and Climate Initiative (CCI) on good agronomic and climate change adaptation practices, reaching over 2,000 smallholder coffee farmers in the two pilot project sites. As part of the initiative, trainings are organized by HRNS to guide farmers on how to cope with climate change shocks. Droughts, rainfall variability, hard to control pests and diseases are just some of the challenges farmers face. In addition to putting the livelihoods of millions of smallholder coffee farmers at risk, these challenges also threaten global coffee supply. HRNS organized a 2-day learning event on 29-30 May 2018 with the purpose of facilitating a visit to the Stepwise demonstration sites for all participants. Sixty-four farmers, extensionists, local leaders, representatives from farmer alliances (Uganda Coffee Farmers Alliance) and government bodies (Operation Wealth Creation Program), and local government officials attended the event. 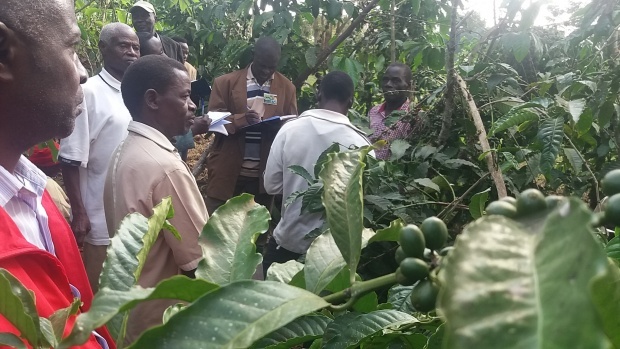 The tour gave farmers a practical learning experience through physical observation of the performance of coffee at different steps of the application of agronomic and climate change adaptation practices. Participants were visibly excited throughout the tour, especially during observation of the final steps of the IITA CSIP, where positive results, such as reduced incidence of pests and diseases and an increase in coffee yield, are visible. Most of the farmers who attended the learning event made commitments to implementing the CSIP on their own coffee farms when they realized that many of the required materials for steps within the CSIP, such as manure and mulch, are locally accessible. Other practices within the CSIP, such as de-suckering, pruning, weed control and Black Coffee Twig Borer (BCTB) control, are already known and commonly employed agronomic practices. The demonstration plots showed farmers evidence that these simple practices bring yield increases. The HRNS and IITA intervention continues to support participating farmers to put into practice what they learned at the demonstration sites through participatory monitoring and evaluation: farmers visit each other’s farms and self-evaluate levels of adoption using assessment tools designed by IITA and HRNS. The participatory-style monitoring and evaluation gives farmers the opportunity to share their experiences, challenges, and lessons learned, and to come up with ideas and solutions for increased adoption. The Luwero District Agricultural Officer (DAO) applauded IITA and HRNS for the innovation of the Alliance for Resilient Coffee (ARC) intervention and committed to including the Stepwise approach in the district agricultural program. * The USAID Feed the Future project – Alliance for Resilient Coffee (ARC) is a consortium of non-governmental organizations and research institutions increasing the climate change resilience of smallholder coffee farmers in 4-countries: Uganda, Guatemala, El Salvador, and Honduras.